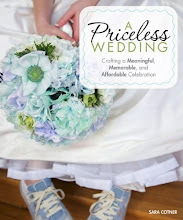 Kindred Spirit Question: I wanted to write you about an issue I've stumbled into with a friend's wedding that is influencing our wedding - the whole business of choosing a best man and maid of honor/bridesmaids. I haven't been to too many weddings, but doing this always made me feel like there was a royal court at the wedding. And what a way to say to everyone else "you didn't make the cut". My boyfriend got chosen to be the best man at this wedding, and while he was flattered, it also kind of felt weird because there are so many guys that are part of their circle of friends that he is close to. It was nice to be chosen, but it also feels like you are excluding people you are close to. When I told him that I didn't even know why people did this and I couldn't possibly choose a "special someone" and that I didn't want to do this at our wedding, he practically jumped for joy. I think he was already dreading how he could possibly pick one guy out of all of his guy friends. I told him that we could put something up on our website or say something during the ceremony about how they are all our "best" people and just delegate tasks to those that want to do them. This feels a lot better to us. I wanted to know if you have written about this on your blog and what your feelings about it are. Is there a good way to do it? It there a fun way not to do it and make everyone feel special? I love that you are asking these questions and figuring out what is best for you all. That's what this whole process is about! It's your wedding and your life. There are times when it makes sense to follow tradition. There are times when it makes sense to modify it. And there are times when it makes sense to reject it all together. Life is about figuring out when to do what. It requires thoughtful consideration, conversation, multiple perspectives, courage, and an ability to apologize (when we realize we wish we would have done it differently). Planning a wedding is really just more practice for navigating through life. So, the answer is simultaneously simple and complex: Do what makes sense to you! Talk with your friends. Talk with your families. Brainstorm ideas together. And then decide (and, once you decide, don't waste a whole lot of time, energy, and emotional resources second-guessing yourselves!). You can stand alone during your ceremony (like my friends Loren and Lisa did at one of my favorite weddings of all time) and forgo the idea of a wedding party altogether. You can invite a whole bunch of people to be part of your "Wedding Team." They can each take on different roles to help make the wedding happen (and you could acknowledge them with fun buttons?). You can form a wedding party out of family members. You can ask a bunch of people who are important to you in your life to play different roles throughout the ceremony. I think with any decisions like this, the key is to start with the purpose. What is the traditional purpose behind having a wedding party? What does having a wedding party accomplish? Are those goals aligned with your own goals? What are your goals? What modifications, revisions, and decisions most align with your own goals? If your goals are simply to have your friends help out, feel included, and be acknowledged for the important role they play in your life, there are lots of ways to accomplish those goals. You can toast them at your wedding. You can include a blurb in your wedding ceremony program (if you have one), you can write them thank-you cards to distribute at the wedding, you could include their pictures and bios on your wedsite (again, if you have one). This was a difficult decision for me as well. If I included my closest girl friends and my sisters, my wedding party would have overwhelmed the more intimate wedding that my fiance and I want. In the end, I asked my two sisters to stand with me. I spent a little time individually with my friends (my sisters!) to explain the situation. Though they won't be dressed in coordinated but un-matching dresses, one will be doing my make-up, another is designing my programs and stationery, one is day of coordinator at my house, etc. All of them will still be with me that morning as I get ready, sharing in the excitement and joy (and making sure my mother doesn't spontaneously combust). These women understood, and that is why I love them. I was really stressed about this. I wanted three bridesmaids, with my sister as maid of honor. This blew up in my face. She said after being in 6 (!) weddings she was never putting a bridesmaid dress again. This worked out even better because she was my photographer (the pictures are our gift from her and her husband. 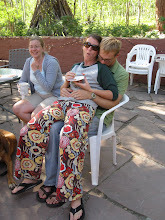 Then I wanted one of my husband's sisters - oy!! The other two sisters became very upset to not be a part of the wedding, so even though I'd met each of them once I said ok. This kept the peace, I then asked my closest friend in town to be maid of honor. 4 bridesmaids!! John doesn't really have that many "real" friends to play "matchy, matchy" with my girls. So, he just had his best man, and brother in-law. Whew!! That took longer to explain than I thought it would. Did I worry that the number was uneven? For a very split second. Once I got a plan for how people would stand during the ceremony I just really didn't care. I'm home from the honeymoon and glad we came home a day early to clean the house after the influx of relatives last week and just spend the day alone in our own home. Choosing a Best Man and a Maid of Honor really isn't important to us, or a necessity for making our day 'perfect'. I say do what you want, and eff the others who make you think you're a bad bride for not wanting the same-old pre-packaged crap. This was a difficult decision for my fiance and I. We've had so many seasons of friends, its so hard to pick just a few. We decided just to have my sister and his brothers stand up. We incorporated other friends into our celebration by asking them to help us throw parties and to play music at our wedding. I wonder if I'll regret having a herd of ladies in matching dressing following me around all day... but I seriously doubt it. Me : Honey, I don't think I want a wedding party. I have been in a lot of weddings, and being in the wedding party isn't very fun. Me : Really? Do you mean it? I asked my best friend and cousin to be our "witness." She won't stand up with us, but will sign the marriage license. I asked my closest sister to marry us. My fiancée asked his best friend to be our second witness. Problem solved! I made a point to tell other close family members and friends that they are so important to me, but we have chosen not to have a wedding party at all. They understand - they aren't being excluded, we simply aren't having one. Warning though, even if you don't have a wedding party, your close friends will ask you how to dress. If you want them to match. Ask you to approve their outfit choices. True story! I guess the part of all of this I still don't understand is what the real meaning is behind the wedding party (the matching dresses, the special titles, etc). What does it have to do with community, connection, and commitment? I can see how choosing special people to stand with you would make you feel closer to them, but it seems like it has so much potential to alienate you from all the other incredibly meaningful people who are in attendance. I could understand picking special people to stand with you if you were on a cruise ship, say, and getting married in front of a bunch of strangers, but otherwise, it just feels funny to pick special people out of a whole group of special people and label them as "more special-er" :) I would love to hear the positive stuff I am not seeing here, 'cause I feel like there must be good reasons for it since it is such a longstanding tradition. Alrighty, think I have written enough! Thanks for posting my question and I look forward to reading all of your comments and thoughts on this! I'd venture a guess to Kristen's question that a lot of the wedding parties developed when weddings were larger affairs, frequently with many of the parents' friends and family members, plus business acquaintances of the parents and the bride and groom, etc. The bridal party was/is a way to indicate who you are really "tight" with among all these masses. In smaller weddings, however, I don't think it's as necessary, though people are often closer to some of their friends than to others, and the bridal party can symbolize that. My sister will be my Lady of Honor (matron sounds way too old) and my best friend (a minister) is marrying us. My fiance will have his best friend as his best man, and that's the extent of our bridal party. But good luck with however you decide to go! Kristen, to answer your question about the meaning behind the bridal party: according to my "The Everything Bridesmaid Book," the bridesmaid started in Roman times. "In order to prevent the bride from being overtaken by evil spirits, up to ten bridesmaids - dressed almost identically to the bride - would accompany her during the wedding proceedings. This strategy was devised to outsmart the evil spirits believed to be present at wedding ceremonies." My plan is to still have a bridal party, but not name a maid/matron of honor, because whoever I didn't pick would be highly offended. My bridal party consists of 3: my sister, my best friend, and my future sister-in-law. Instead, I've decided they are all going to wear flats and stand in height order. Fair to all and favoring none. Picking a wedding party and particularly a MOH really makes me nervous. Which is why I've decided not to have any sort of wedding party. I have three best friends who all are so different to me. One will do all my stationary (thank goodness for graphic designer friends! ), one will *hopefully* sing a song at the reception, and the other will likely be my friend who does the DIY with me. My guy didn't want a wedding party either becuase the guy who he had always thought would be his best man, doesn't like me! We will likely have a chuppa, and if it's not a freestanding one, we are having my brother and his brother and sister hold three of the poles while the fourth pole will be held by the girl I have babysit her entire life who is like a little sister to me. Her two little brothers will be our ring bearers. So, while there will be no wedding party, our closest friends and family will have roles. We are also offering to our closest friends the option to "say a few words" (less than 2 minutes each) in liu of MOH and Best Man speeches. I think it will all turn out beautifully. When my friends got married in Colombia, they had no wedding party. I think that in some other countries, it is not even considered. Makes things a lot less messy. We had a Jewish wedding, so we had to have four people to hold the huppah poles. This totally made sense to me--we had people standing up with us, but they were DOING something. The huppah represents our house together, and to have four people who were close to us hold the poles symbolized how those we loved held us up in our community. 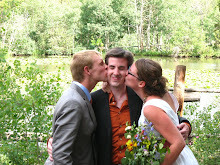 It was a little tricky, since we certainly had more than four people we wanted to honor at our wedding. But my parents played music as we walked up the aisle, my cousins carried the ketubah in, my grandma lit candles, his mom and sister did readings during the ceremony, plus our two brothers and two best friends holding the huppah. 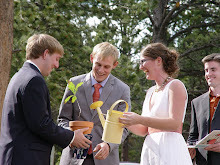 There are plenty of ways to involve people in your ceremony besides just having them stand there. And I have to say, it was intensely meaningful to me to literally be surrounded by four people I loved during the wedding ceremony.